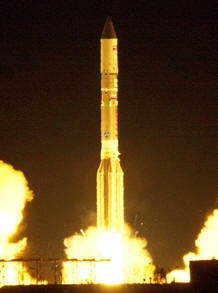 November 16, 2010 - Boeing has received the first on-orbit signals from LightSquared's SkyTerra 1 following the satellite's launch at 12:29 p.m. Eastern time on Sunday on an International Launch Services Proton vehicle from the Baikonur Cosmodrome in Kazakhstan. Controllers at the ground station in Hartebeesthoek, South Africa, confirmed initial contact with the spacecraft at 9:50 p.m. Eastern time. Signal acquisition indicates that the satellite is healthy and ready to begin operational testing and on-orbit maneuvers. SkyTerra 1 is a Boeing 702HP satellite designed for geomobile services that will provide satellite coverage as part of LightSquared's new broadband mobile wireless network in the United States. "There is a large and rapidly growing demand for data services to U.S. businesses, individuals and other end users, and Boeing has accomplished the first step in delivering this capability to LightSquared with the successful launch of SkyTerra 1," said Craig Cooning, vice president and general manager, Boeing Space & Intelligence Systems. "Boeing has been designing advanced geomobile satellite systems for the past 13 years, and our experience enables us to provide LightSquared with a high-value solution." When operational, SkyTerra 1 will combine with ground-based beam-forming (GBBF) equipment and ground stations to form LightSquared?s first Space-Based Network (SBN), which will enable faster service and broader access to smaller mobile devices for millions of users in the United States. The Boeing-built SBN will benefit from the satellite's 22-meter L-band reflector, which reduces the need for larger antennas and battery-draining receivers inside mobile handsets. LightSquared's SBN will combine with a ground network of more than 40,000 base stations built to offer ground coverage, satellite coverage or a combination of the two. LightSquared plans to begin rolling out its nationwide wholesale 4G LTE wireless network in the first four markets in the second half of 2011. Boeing and LightSquared will soon begin on-orbit maneuvers to move SkyTerra 1 into its test orbit location, where the spacecraft will begin deployments and signal testing. After validating the satellite?s subsystems and the SBN with ground stations, LightSquared will accept the SBN from Boeing in early 2011. Boeing, the prime contractor for LightSquared's satellites, built SkyTerra 1 at its integration and test complex in El Segundo. Harris Corp. of Melbourne, Fla., developed the satellite?s L-band reflector. ViaSat's Comsat Laboratories in Germantown, Md., is providing the GBBF equipment, the uplink beacon stations and the ground stations' control and monitoring system. SED Systems of Saskatoon, Canada, is providing the antennas, RF elements and integration services at the gateway stations.